Today on my blog I am thrilled to be joined by Canadian author, Philip Wilson with a fabulous guest post about his main character Sarah -from The Librarian. Grab a cuppa and enjoy! 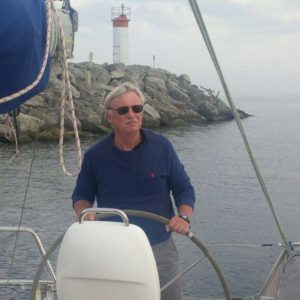 Philip Wilson is a retired financial executive who spends winters in Florida and summers sailing on the Great Lakes in his 32-foot sailboat. He lives in Toronto, is married and has an adult son. He’s currently working on his second book, Songs for Lucy. Connect with Philip Wilson on Goodreads or through his website: www.philipmwilson.com. A shy librarian accidentally stumbles on a conspiracy by a group of rogue cops. Assaulted, framed and sent to prison to ensure her silence, Sarah discovers a fierce will to live and a startling capacity for violence that enables her to survive the harsh prison environment. On her release, Sarah learns her father died alone and her old life is gone forever. Heartbroken and enraged, Sarah devises a chilling revenge for the men who destroyed her world. As she prepares, she meets Paul Taylor, an ex U.S. Navy SEAL, who teaches her the skills she needs but also shows her love and the promise of a new life. As Sarah begins her hunt, the cops’ disbelief turns to terror as they realize they are being stalked and killed by a librarian. 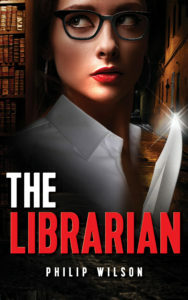 “In THE LIBRARIAN author Philip Wilson takes the most desk-bound of professions, that of the librarian, and pits it against one of the most horrifying—the bent cop who is not only armed and dangerous, but who can also plant evidence on the victim after pistol-whipping them to the ground. But the playing field is not so un-level, for although Sarah is assaulted, framed and then imprisoned by corrupt cops, she discovers a talent for violence in the Social Darwinist world of the prison system. The world is a big place and we all feel a little powerless at times. We enjoy stories where the victim finds the strength and courage to fight back and overcome their oppressors. Take the Count of Monte Cristo. In The Librarian, Sarah, a shy librarian who has led a sheltered life, becomes the victim of a conspiracy that sends her to prison. While in prison, she finds herself faced with the choice of being killed or fighting back, and she instinctively fights. In doing so, she discovers a startling will to survive and a determination to seek revenge on those responsible for her fate. In the following scene, after being tormented mercilessly for days, she is again confronted by one of the prison bullies and suddenly finds the will to fight. She then fights back and kills the prison bully and from that moment, her fear and passivity vanish. From a bullied newbie, she becomes one of the most feared inmates in prison. The extraordinary transformation continues upon her release as, one by one, she undertakes brutal revenge upon the rogue cops who once dismissed her as “a librarian”. As I wrote the book, the story became as much about Sarah’s discovery of her own inner strength and her capacity for anger, as it was about her specific acts of revenge. While I hope The Librarian is a satisfying revenge thriller; at a second level, it’s also a story of self discovery. Sarah finds within herself, not just self-assurance and resilience, but a startling capacity for anger and a determination to seek retribution. For the first time, she takes control of her life, dictating events rather than responding to them. While Sarah revels in her transformation, the exhilaration she feels in carrying out the savage revenge against the rogue cops almost frightens her. One of my favorite exchanges occurs where Sarah begins to have doubts about the brutal retribution she is inflicting and questions her ex-Navy SEAL lover, Paul Taylor. Through the terrible injustice which befalls her, Sarah truly finds herself and finds love for the first time in her life. It’s not quite the story I set out to write, but I like it better. Wow! I am totally intrigued by Sarah and this #RevengeThriller! Thank you so much for such an interesting post, Philip! If Sarah’s journey has intrigued you, then click the book below and grab a copy of The Librarian! 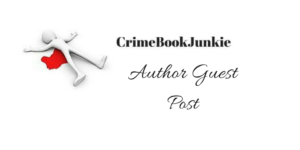 This entry was posted in Author Guest Post and tagged #ActionPacked, #CrimeFiction, #CrimeThriller, #GuestAuthorPost, #Murder, #Suspense, #Thriller by crimebookjunkie. Bookmark the permalink.